What's the deal with compressor pedals? We spoke to pedal designer Simon Keats about why you should have one on your board, plus we find out why classic studio compressors like the 1176 are so sought after. Simon Keats, the designer and MD at Origin Effects gave us the most amazing answers and some really good advice for using a compressor. So good in fact that we decided to share his knowledge with you and dedicate a post to him and Origin Effects! Why do I need a compressor? I already like my guitar signal! “There are many factors being conveyed when we loosely describe a good guitar signal. Perhaps the most obvious factor is that of pure tone, and by this I refer to the tonal balance of the woods and strings in conjunction with the pickup response. This really should be the first consideration for anyone looking to obtain a good live or recorded sound. Next you choose a good quality amp and very importantly good speakers. These are the major tonal blocks that go to make up most traditional guitar tones. It’s widely known and not exactly rocket science. The pickup, amplifier and speaker manipulate the frequency content, generated by the guitar’s physical vibrations, to produce the final tone we hear. It can take many years to arrive at the right combination of guitar, amp and speakers, and this will no doubt involve a few regretful purchases and a good amount of experimentation along the way. Understandably, once you’ve reached a happy point the last thing you want to do is compromise this by adding pedals and other seemingly unnecessary gadgets. …compression can be used to free you up from the basic objective of being heard! Once this is done, you can concentrate on using playing dynamics to achieve more creative goals. The vast majority of pedals will mess with your tone in some way. The pedal designer’s objective is to enhance your tone, but in reality each pedal has been designed to sound good within the context of the designer’s own setup (or setups) and the chances are your setup is quite different. The prospects for tonal catastrophe are very real, so why bother? Well, the truth is that this isn’t the whole story. Beyond these tone-shaping factors we must also consider dynamics. i.e. how hard or how softly you pick individual notes and chords, and how long they ring out for. A truly transparent compressor can enhance your guitar sound in a way that doesn’t mess with the frequency-shaping ingredients, instead manipulating volume from one passage to the next, tightening up energetic rhythm playing and then a moment later revealing details that would otherwise be lost gems in a delicate arpeggio. A clean electric guitar has an enormous dynamic range. This means that it’s capable of produce tiny, barely audible notes when played very softly, as well as loud transients when given some stick! This is fine when playing in isolation, but it can present problems within the context of a band or ensemble. Add drums, bass, keys (or shock horror, another guitar) and you’ll naturally have to turn up your amp to be heard. If you turn your amp up and achieve a balance whilst playing energetic chords you’ll no doubt find that subtler passages will be totally lost. Likewise, if you set the amp whilst playing quietly you’ll find that louder chords will now be way too loud, and you’ll have to curb your enthusiasm for the benefit of the overall mix. A compressor will effectively reduce the volume at the points where you would otherwise be too loud, and then boost your volume at the points where you’d have previously vanished from the mix. This is a simplified definition but none the less helps to convey the basic concept. Put another way, compression can be used to free you up from the basic objective of being heard! Once this is done, you can concentrate on using playing dynamics to achieve more creative goals. For example, you’ll find that you can play lightly to get a softer tone and louder to get a snappier tone. The compressor can be set to even out the differences in level and so you have a widened tonal palette. You’ll also find that you can make greater use use of vibrato to extend the life of notes. The compressor will gradually ramp up the volume as the note decays creating the illusion of much greater sustain. Subtle harmonics and legato phrases sit well next to louder picked notes as the compressor works its magic, the finer details are all suddenly present in all their glory. Why are compressors like the 1176 so in demand and so highly revered? “Like other FET based compressors from the late 60’s and early 70’s, the 1176 is capable of reacting extremely quickly in order to make dynamic adjustments, which is a good thing. It’s also very transparent when it comes to preserving the tonal attributes of the signal being compressed. Importantly background noise levels, typically heard as hiss, are low enough to go largely unnoticed. That said, the main reason that people like these older units is that they have character. As is the case with most compressors, the scope of the gain reduction (the automatic adjustments in signal level) can be huge or subtle depending on the settings the user dials in. However, when pushed very hard the effects of any compressor will become audible in quite an obvious way. And it’s here that major differences in contrasting designs can be heard. Modern compressors can sound quite unforgiving and hard, where many classic designs will impart an organic charm or vibe. The 1176 has a compression response that’s both organic and complex in its nature, perfectly complementing our guitars which are in themselves organic in their nature due to being made from lumps of wood and metal. By contrast, modern compressors can sound a bit too brutal with their sharp knee responses, meaning that they make direct, abrupt changes to signal levels in an overly precise, and sterile, way. These are often based on the “Feed-forward” mode of operation, where the system monitors the input signal and produce a highly predictable output based on simple linear maths. Entirely logical and therefore fairly digital in terms of sonics. The 1176 was a real game changer when released and quickly found a home in every major studio worldwide. It has a characteristic sound that can be heard on countless classic recordings. 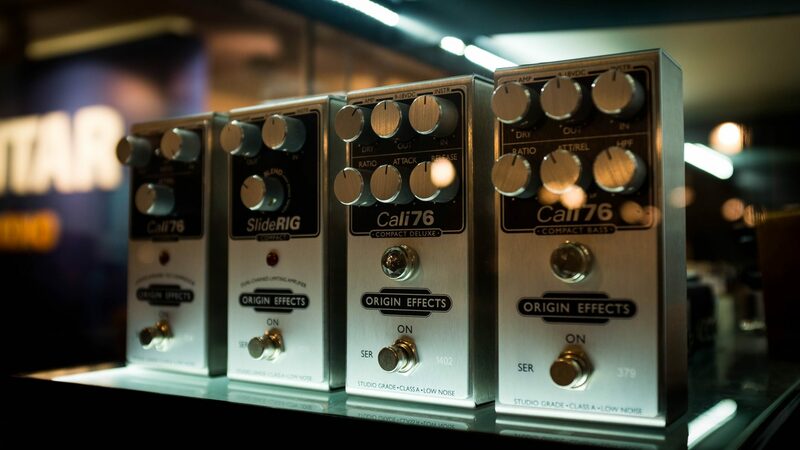 The Cali76 allows you to recreate this famous studio tone right in your rig. Processing the signal directly from your guitar has a clear benefit over post-processing in a studio, in that the signal-to-noise ratio is optimal. Mic’d studio tracks invariably feature bleed from other instruments, as well as hum from amplifiers etc… A compressor will highlight any impurities, and these soon become limiting factors in how far things can be manipulated. 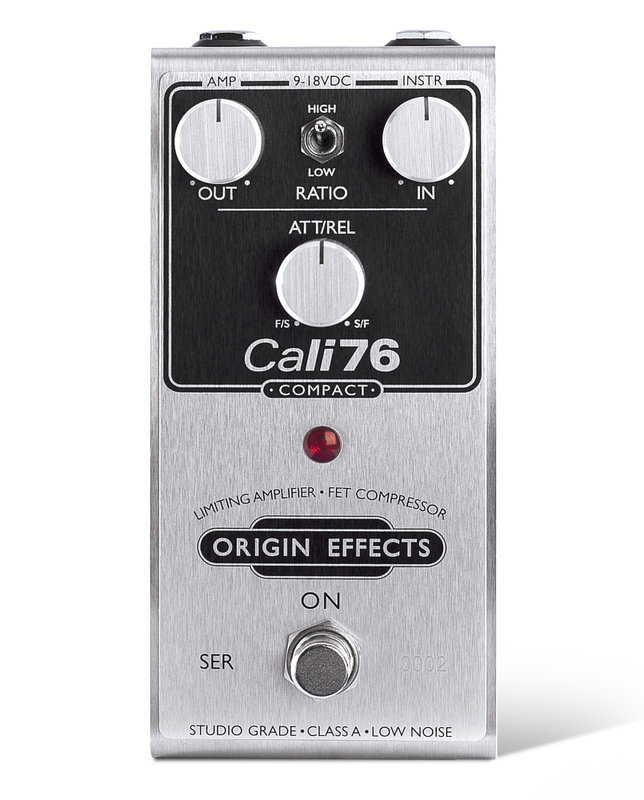 Compressing directly from the guitar straight into an 1176 used to be the stuff of dreams… Time to plug into the Cali76 and pinch yourself! Want to find out more? Read our Ultimate Guide to Compressor Pedals.